But now, you can help in a big way by simply recycling and cashing in your empties or by donating your deposit beverage containers with the Empties 4 Food program through Regional Recycling. This simple task will help ensure more of Nanaimo has access to healthy, nutritious food. All you have to do is follow these five easy steps and 100 per cent of the proceeds from your empties will go to benefit the Loaves & Fishes Community Food Bank. With 20 bins throughout Nanaimo, Lantzville, Cedar, and Cassidy, you’ll be sure to find something close by. Here’s a handy map and index so you can pick the closest bin to you. Seriously, that’s it. Pack up your bottles & cans, load them in your vehicle and drive to your nearest location. You won’t have to sort anything, just bag it up. Bin locations always have plenty of space for you to park and do the drop-off. Just grab the bag, put it in the bin, and you’re done. I know you keep waiting for a catch, but that’s it! Thanks to you, 100 per cent of all proceeds from your empties are going to the Loaves & Fishes Community Food Bank. For every single dollar they collect through deposit refunds, they provide $5.98 worth of food to those who need it most. But that’s not the only way you are helping Nanaimo! Did you know that when you put your empties in your curbside recycling, the recycling gets shipped to the Lower Mainland, and all the deposit refunds stay on the mainland? 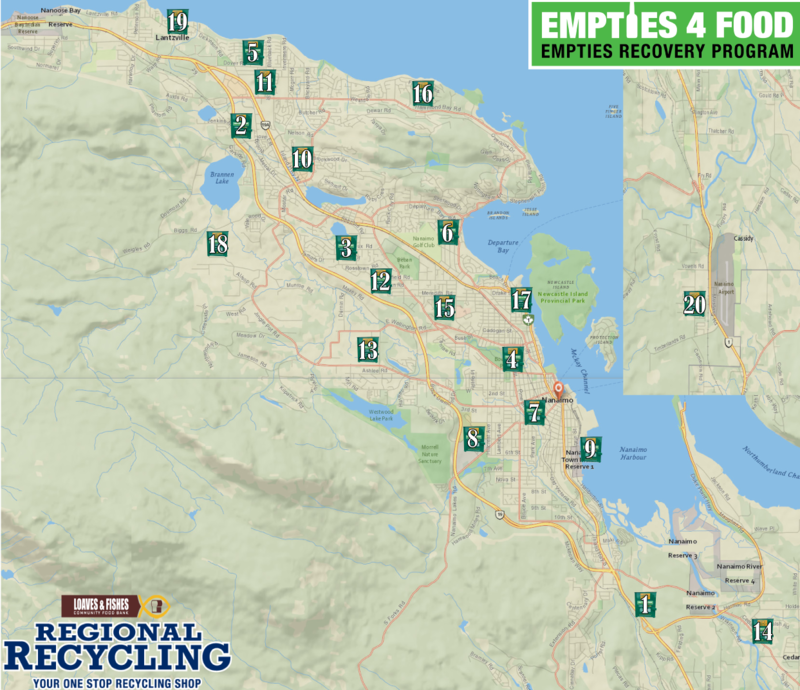 When you recycle through the Empties 4 Food bins, your empties will be heading to Regional Recycling, a locally owned business here in Nanaimo therefore creating local employment and keeping the deposit refunds within our community. Of course, you’re also helping the environment by keeping those empties from ending up in landfills and the waterways. So truly, you deserve three pats on the back! It’s so easy, it’s so fast, and it helps the community and the environment. Set a reminder on your phone, calendar, day-timer or whatever you use and make a habit of recycling and helping your community one empty at a time.